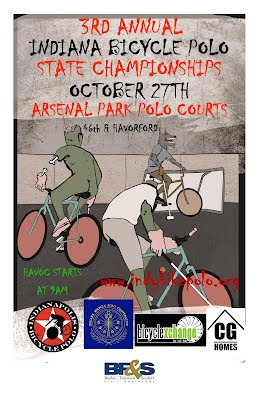 TOP SHELF POLO: Indiana State Championship 2012 - this weekend in Indy! Indiana State Championship 2012 - this weekend in Indy! I know this isn't a major tourney that most people pay attention to, but for our five small clubs in the great state of Indiana this is the bee's knees. We have a lot to celebrate this year- first permanent polo court in the state (with 4 ft boards nevertheless), our newest club Muncie will be sending three teams, and we have lots of new and upcoming players to welcome to the family. Saturday will be less like a tourney and more like a family reunion in the park, and i love that. That's not to say there won't be serious polo- in fact Kevin White will be flying back from Phoenix to play in his last tournament as a Hoosier, and it will also mark the final battle in the great rivalry that has been Apolo III vs Tree City. I can't wait! See y'all there! And don't forget to make some food for the pitch-in lunch! For lunch there will be food trucks. We aren't doing pitch in this year. Tyler, i thought keith said pitch-in for lunch and food trucks for dinner? "Breakfast will be served at 8 am. Bring a dish if you would like to share. There will be a food truck there for lunch. We will not have a potluck lunch this year." sweet, thanks for clarification. i'll definitely be bringing some breakfast food. and then skedaddle your asses to Louisville for your afterparty! Storm Eva Bandman! It's a costume race too!